Well folks, it’s not much to look at from the outside today, but we’ll be working on it. 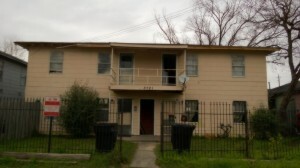 The property consists of an 8 unit building, a 4 unit building and an empty lot for parking. Address is 3721 Tuam, Houston TX, 77004. Each unit is a 2 bedroom / 1 bath. The good new is: We’re going to be renting them cheap while we work on the place. The rent will be $400 for a 2 bedroom (about a third of what it would be a few miles away in Montrose), and we’ll offer an “All Bills Paid” option if someone wants it for $100/month. So $500 for an all-bills-paid two bedroom. Minutes from downtown, Montrose, Heights, Rice University, Medical Center, the new rail line, and University of Houston. Houston – Fastest growing economy in US! 3711, 3717, and 3721 Tuam. You wouldn’t want to see interior pictures of how the units are. We start upgrading them tomorrow. We have a few people that have taken units already that we need to get fixed up for their March 1 move in. As soon as those units are done we’ll be making a page for this property with pictures.